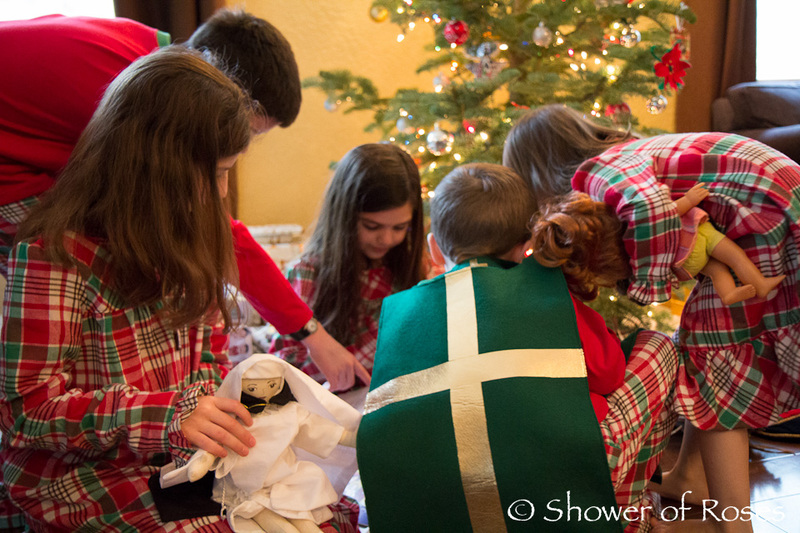 We began our Christmas morning praying the Joyful Mysteries of the rosary together as a family. 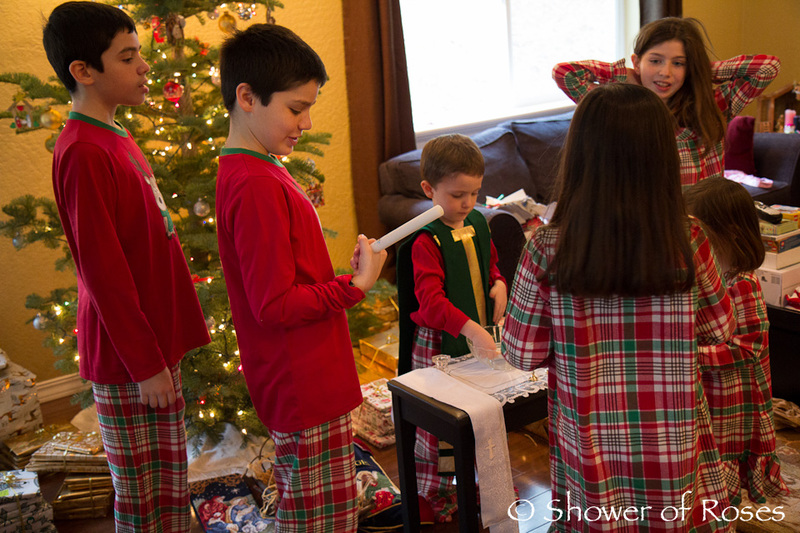 Then, after digging through their stockings, the children all asked is if we could exchange Christkindl gifts first, before opening their gifts from their dad and I! 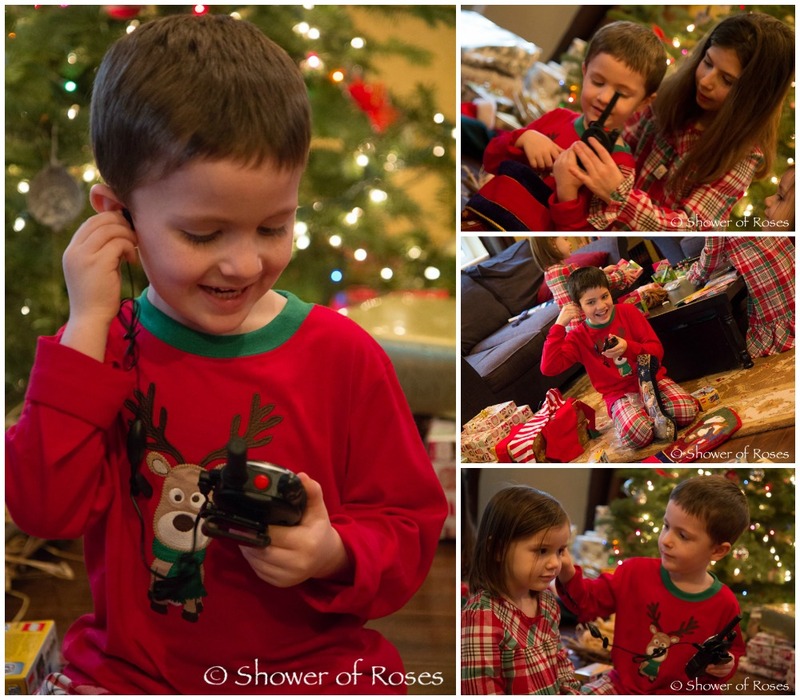 The Walkie Talkies, Metal Earth Models, Snuggles Toy Swiss Army Knife and Captain's New Watch were a few favorites found in the stockings this year. 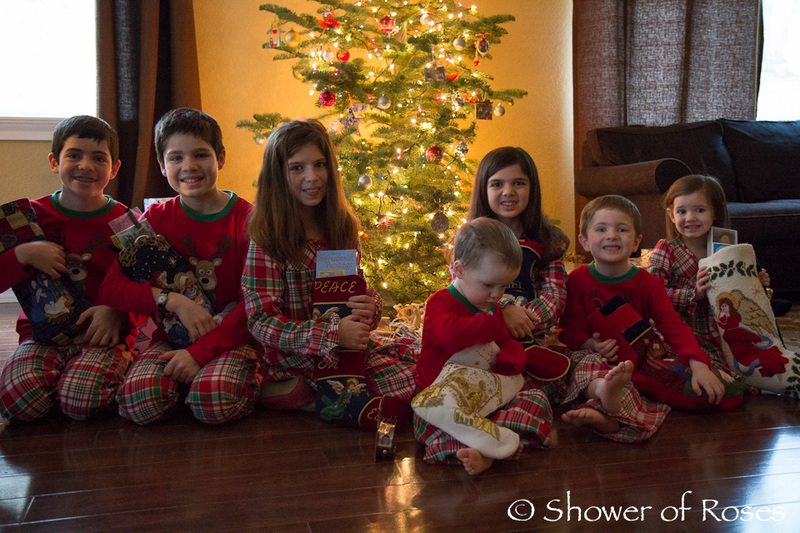 Like last year we gave each child an allowance (except for Captain who asked if he could use some of the money he was given on his last birthday) to choose a gift for their Christkindl. Sean ended up having Twinkle Toes and picked out a new puzzle for her, I had purchased a new calendar for Sean to use at work, Captain had spent some of his own savings on a restaurant gift card to give to me, which he had purchased at the local grocery store, so that Sean and I could go out to dinner sometime (so thoughtful! ), Rascal had picked out a doll dress for Chiquita, Twinkle Toes gave Captain his wished for Original Perplexus (which he has already mastered - he's ready for the Epic! 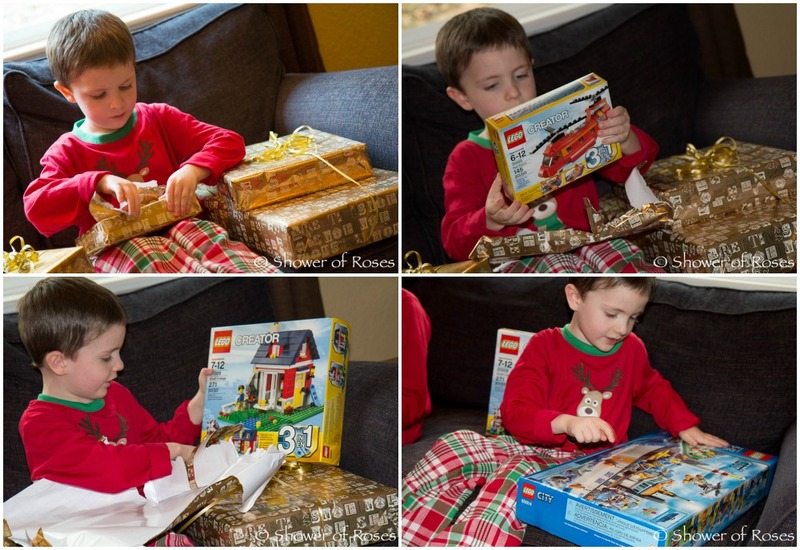 ), Chiquita picked out a lego set to give to Rascal, Snuggles gave Bud a block set (like this one), Rose gave Snuggles the Rookie Perplexus (we were able to find these locally at 50% off! ), and Bud helped me wrap a pink tutu (made by a friend of mine) for him to give Rose. 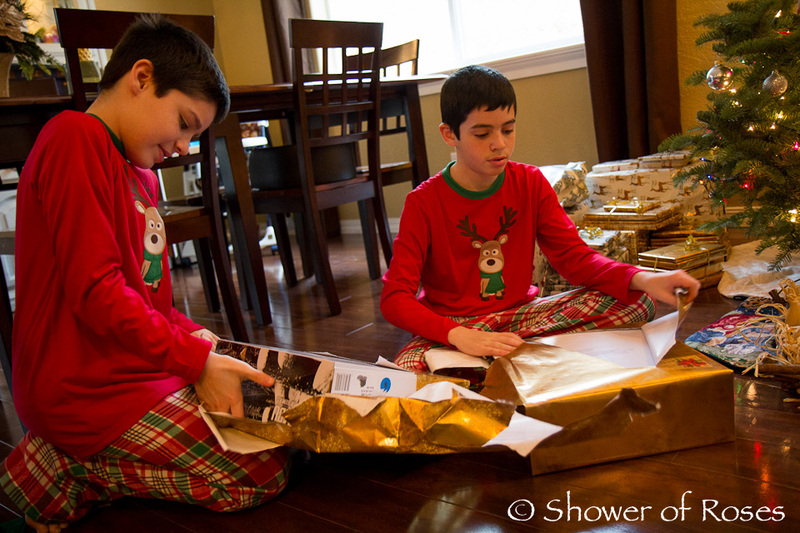 I did list the gifts we planned to give our children in this post, but I will try and include the links here (along with any changes) as well. 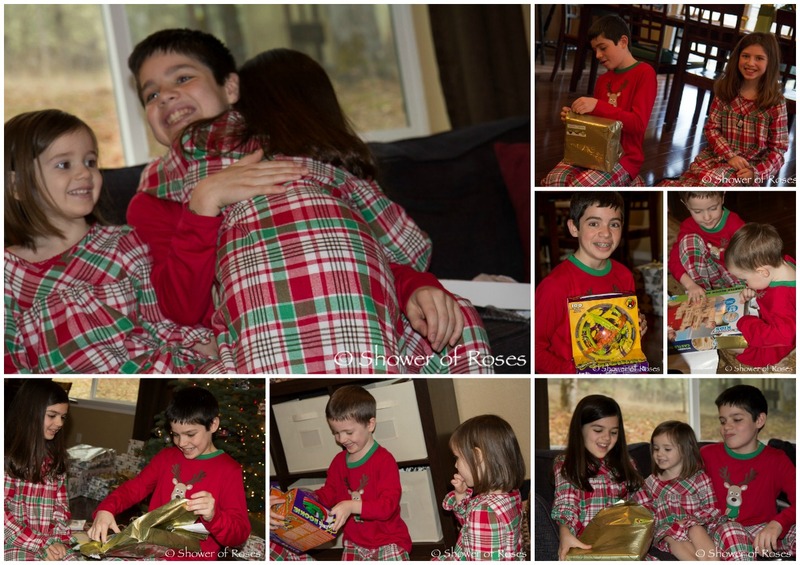 Our children were blessed once again this Christmas with many wonderful gifts, in addition to new hats and mittens from my parents and gifts from Sean's parents on Epiphany! They also helped pack and ship gift packages to a couple struggling families. The income from my new sponsors here at Shower of Roses, along with the commissions received though all the affiliate links, has been such a blessing! 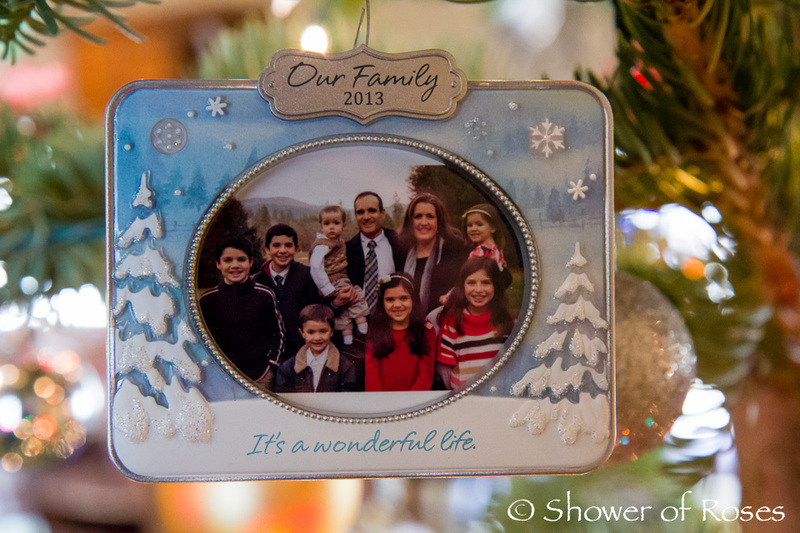 Thank you to all those bless our family by sponsoring this blog, using the affiliate/sponsor links, or with your prayers. May God reward you!
. : Gifts for Captain and Rascal :. Captain received Lake-Town Chase, Creator Treehouse, and Leaning Tower of Pisa. 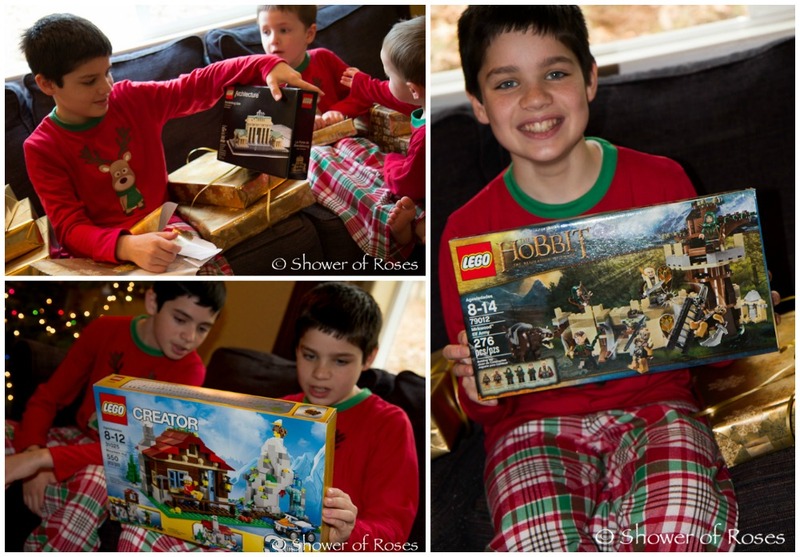 Rascal received the Mirkwood Elf Army, Mountain Hut (I love this new lego set! ), and the Brandenburg Gate. It didn't take the boys long at all to have all their new sets assembled! We had originally planned to surprise them with their own Cassocks and Surplices, but I made a mistake when ordering them (I ordered red instead of black) and didn't have time to exchange them before Christmas since they were ordered online... Whoops! Just before Christmas I saw some winter snow boots at Costco, which they really needed, so I picked those up to give them instead. 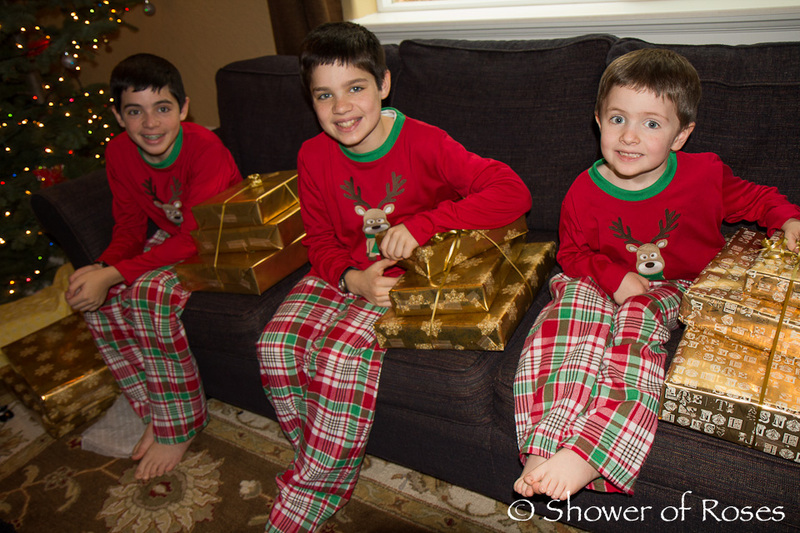 *I love that my big boys are so sweet and were more than willing to humor me by wearing the matching reindeer pajamas... 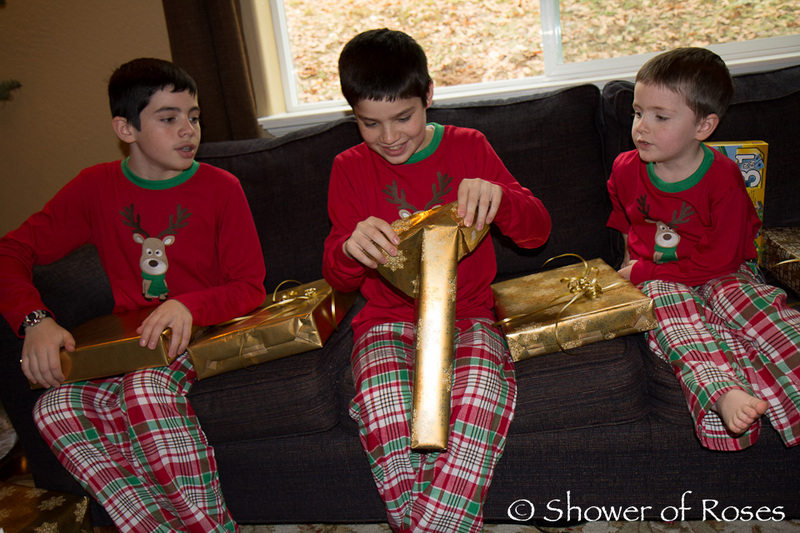 I usually just give them the plaid pants with a solid/plain t-shirt, but didn't have the time to find one this year. They are probably glad that they will outgrow the Gymboree sizes soon!
. : Gifts for Twinkle Toes and Chiquita :. 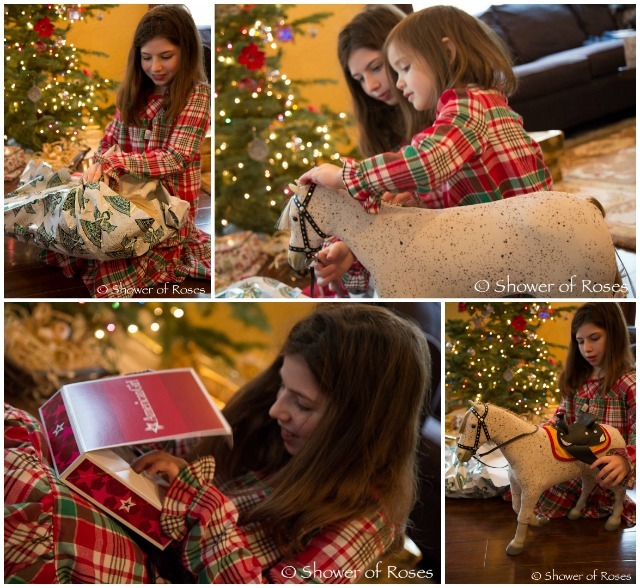 Twinkle Toes was given Saige's Horse and Saddle Set (purchased before they sold out), along with Caroline's Holiday Gown. It is always so much fun to watch Chiquita open her gifts. I just love her excitement and squeals! 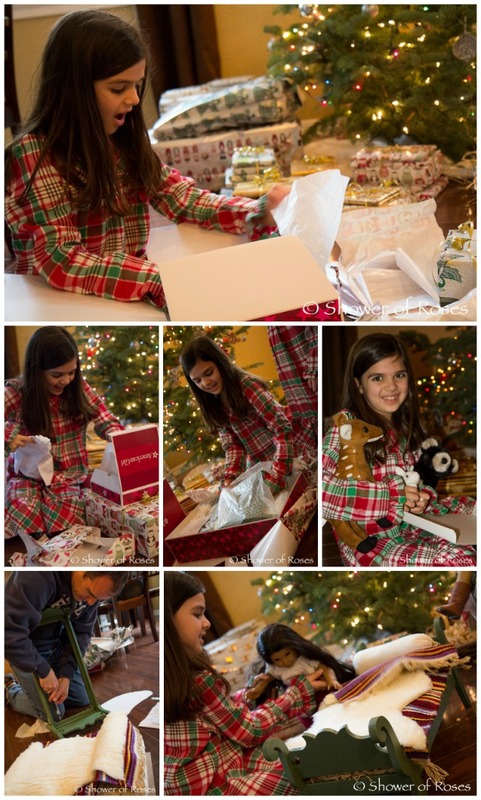 This year she received Josefina's Bed and Bedding, Kaya's Animals, and Josefina’s Feast Outfit. 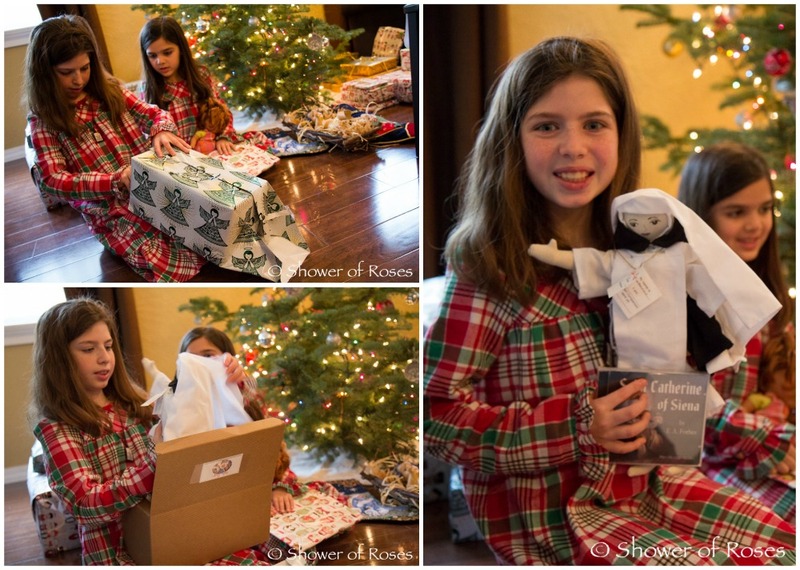 Twinkle Toes was given a St. Catherine Doll and audio book. 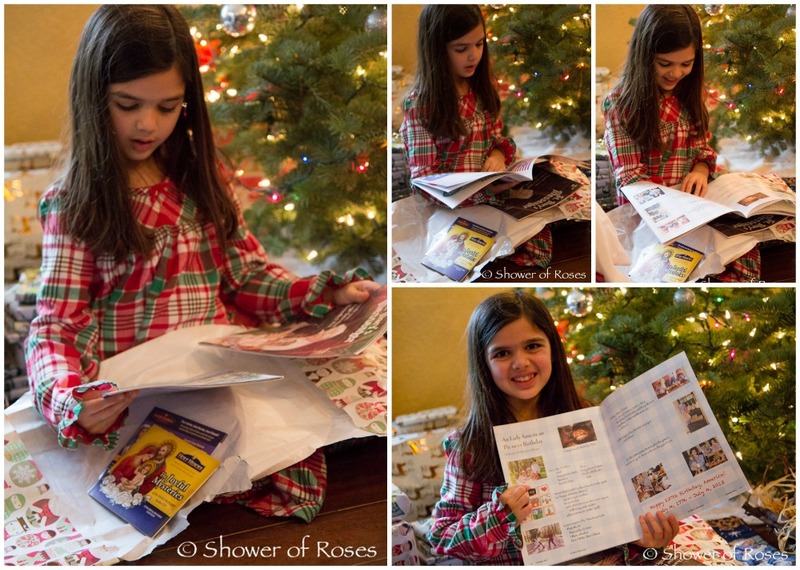 I also enjoyed watching Chiquita flip through the pages St. Mary's Messenger (we gave her a subscription to St. Mary's Messenger and a couple Holy Heroes CDs) and seeing her excitement when she discovered the pages featuring one of her past birthday parties!
. : Gifts for Snuggles :. My dear friend Erica made Vestments for us to give to Snuggles! (She was going to try and open an Etsy shop before Christmas, but that new godson of mine arrived a bit earlier than expected with a few complications! Hopefully this year!) This little boy just loves playing Mass and he had to try them on immediately. 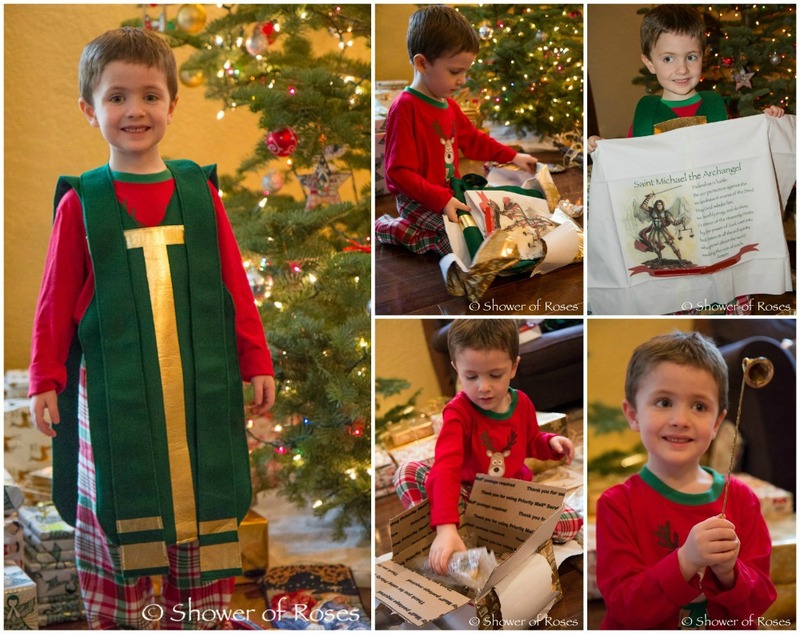 His excitement continued to increase when he discovered his new St. Michael the Archangel Pillowcase and the Baptism Set! It didn't take long for the baptisms to begin! Snuggles also received a stack of three lego sets including the Coast Guard Patrol, Small Cottage, and Red Rotors.
.: Gifts for Rose :. 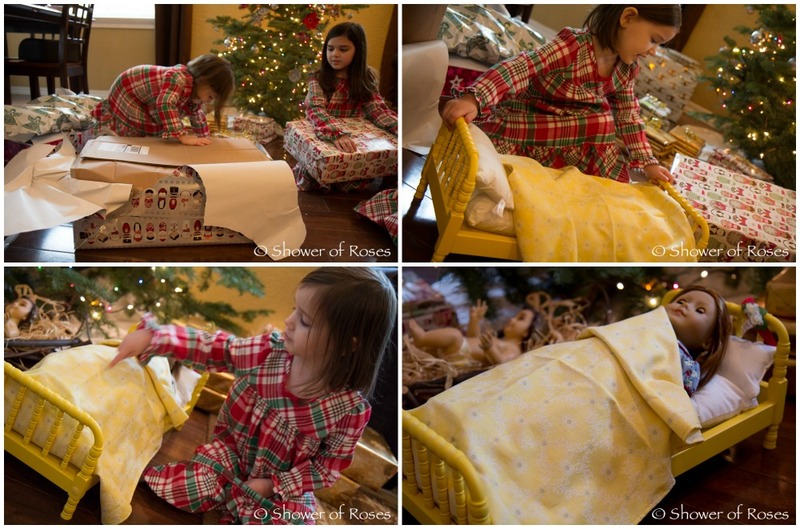 Rose received Molly's Bed and Bedding (for Emily), Emily's Holiday Gown, and Emily's Dog Yank. She also received a set of Pink Rosary Roses and a St. Therese Pillowcase.
.: Gifts for Bud :. 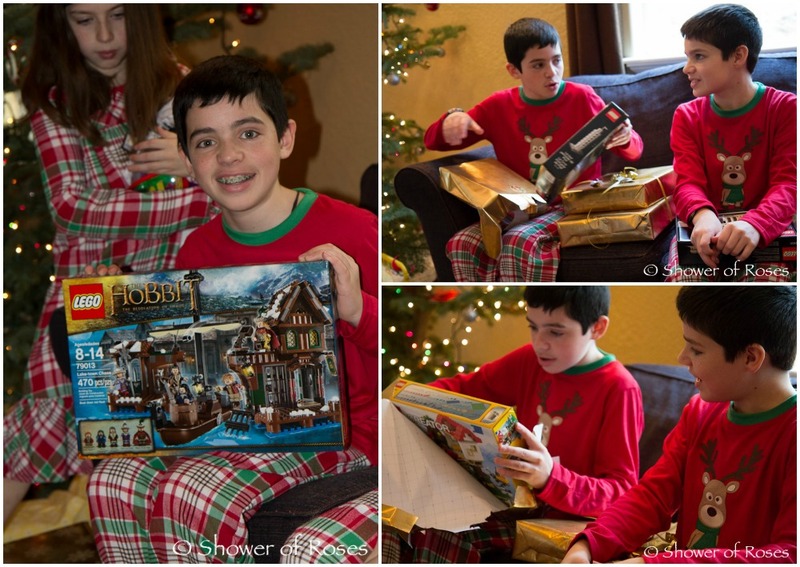 Bud was so excited when he opened his (way too many!) 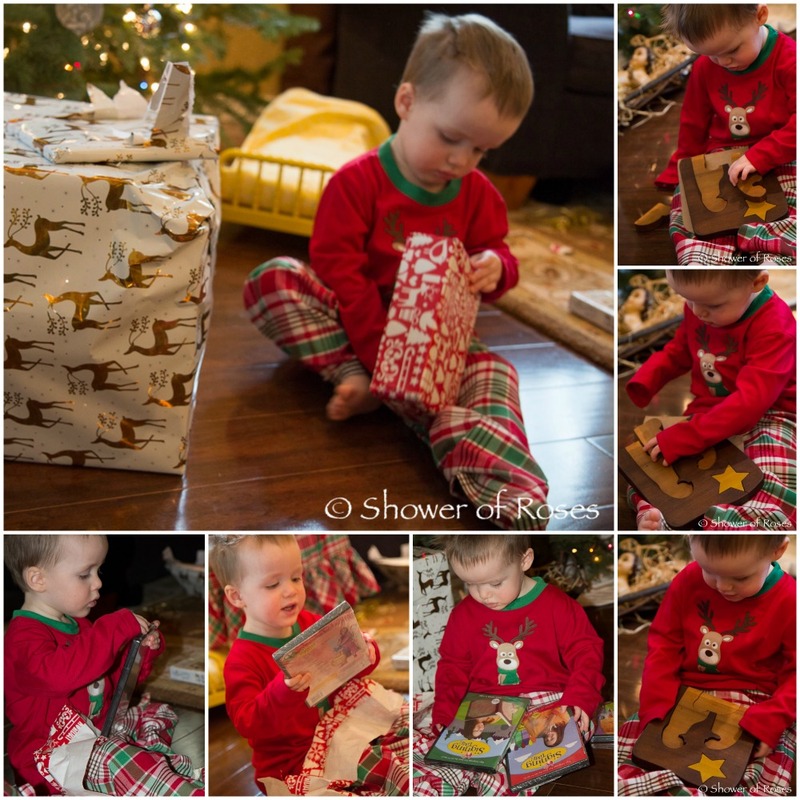 gifts from his godparents! The Signing Time DVDs they sent completed our collection and the Nativity puzzle is simply beautiful! 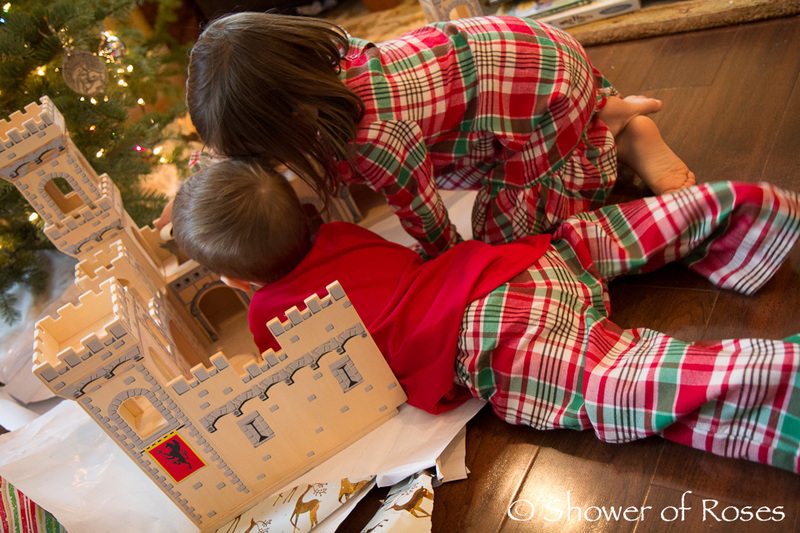 ... and I had originally been torn on whether to order the Melissa & Doug Deluxe Folding Medieval Castle, since the girls already have the Princess Castle, but Sean talked me into it when it was featured on one of the Amazon Lightning deals. I'm so glad he did! It's nice to have the "boy" version and it has been played with so much already! 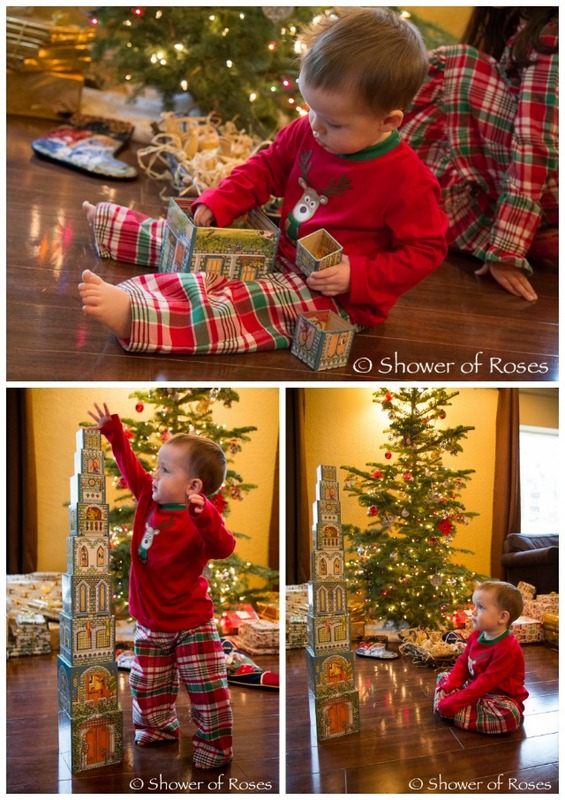 In fact, I often see our three youngest playing with the two castles set up together. It's a bit of a drive, but we were very excited to hear that Father Carmelo was asked to offer Mass at the Veteran's Domiciliary Chapel at 4pm on Christmas Day! 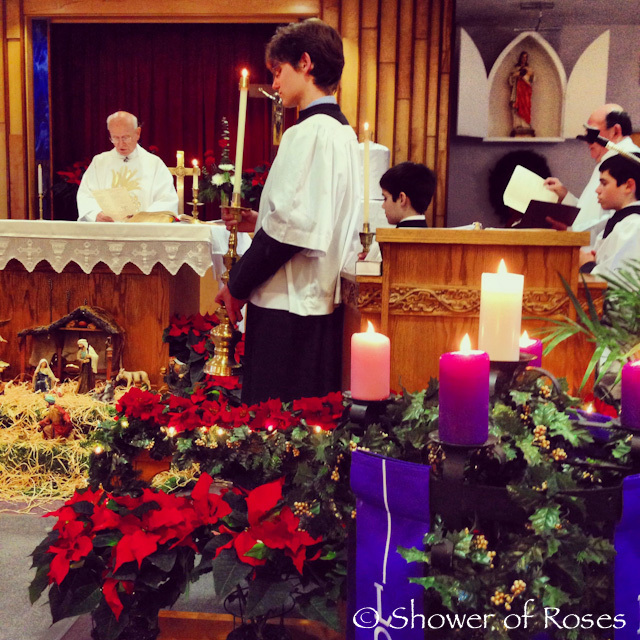 This year, instead of attending the Midnight Mass, we attended Christmas Mass at the Dom and the boys were able to serve for Father once again! 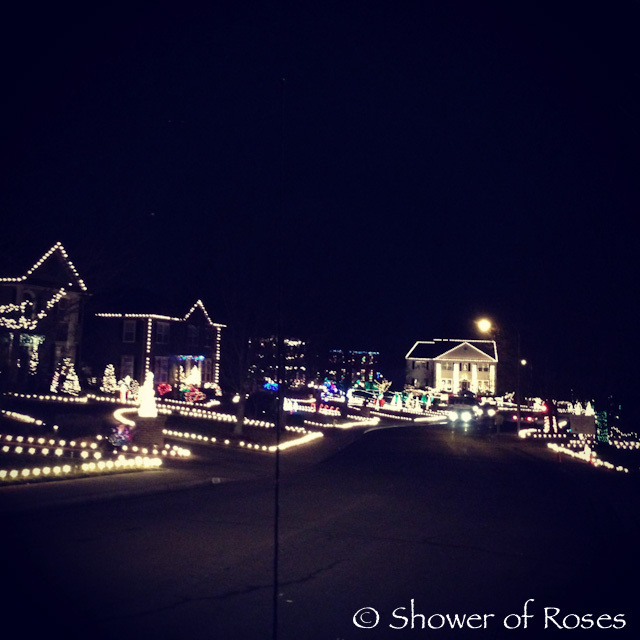 After Mass we drove around looking at Christmas lights in a nearby town before coming home for dinner. It was such a wonderful day filled with joy and blessings! I was SO looking forward to this post! :) I've been checking your blog every day wondering if you were able to post this all yet lol. (By the way, I'm sorry you haven't been feeling well lately...that's no fun! I haven't been feeling the greatest either this week. I guess it's that time of year...) anyway, THANK YOU for posting this! Looks like the most joyous, blessed Christmas. :) God bless you and your family, Jessica. Really?! You know, I actually wondered if anyone would notice if I skipped it this year. :) Just looking at all the photos and trying to figure out how to turn them into a post was a little overwhelming at first, especially while sick. lol I'm glad I finished it though! My children always love looking back at these types of posts. I hope you are feeling better now too! God bless! You have a way of capturing joy!!!! God continue to bless your sweet family!! Everything is so beautiful. Thanks for sharing. 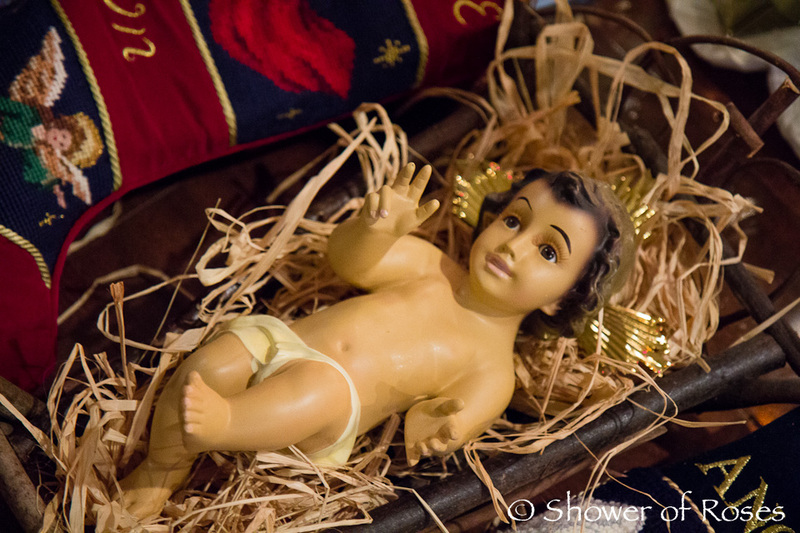 Do you know where you got the Nativity set that has the angels holding candles? 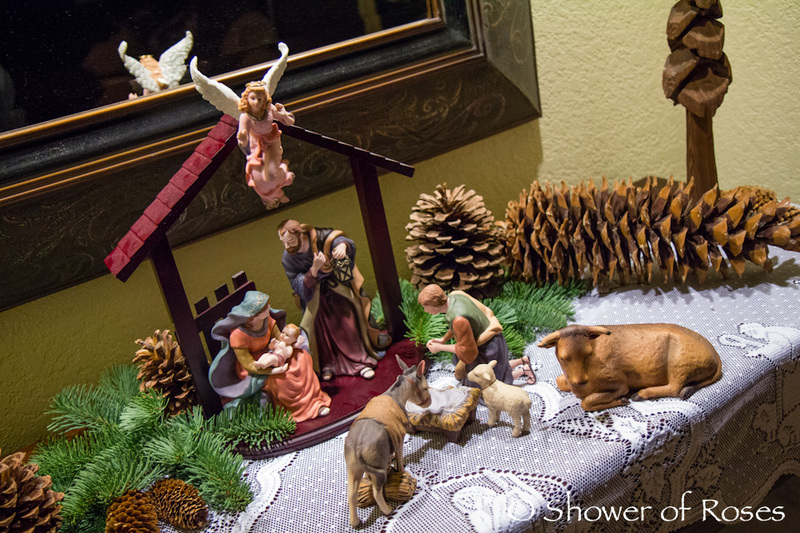 I want to purchase a Nativity set and have been looking online but have seen nothing like your set. Thank you! I actually purchased the Holy Family Statues at Costco back in 2010. I think I only paid $28 for the set, including the background/mirror! 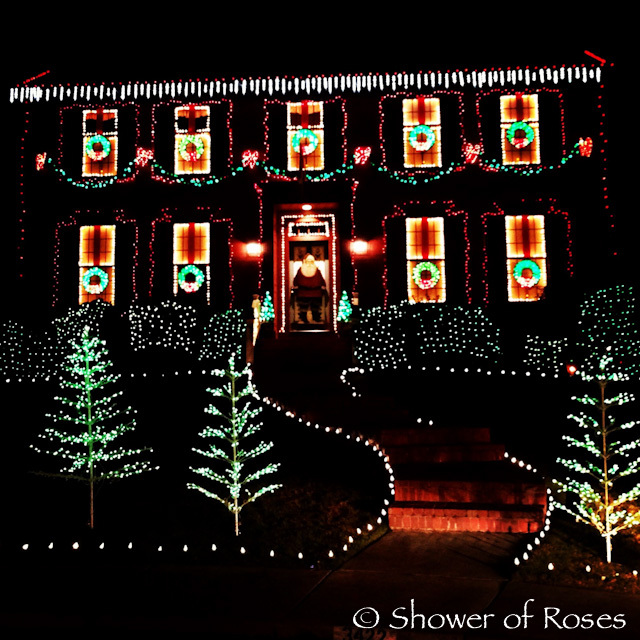 The angels were also from Costco, and though I did see them a number of years ago, I couldn't purchase them at the time, as much as I loved them. I was so excited a couple years ago when a dear woman from our parish gave me the set! They have been sitting on top of my bookcase that hold's all of our saints and feast day books. 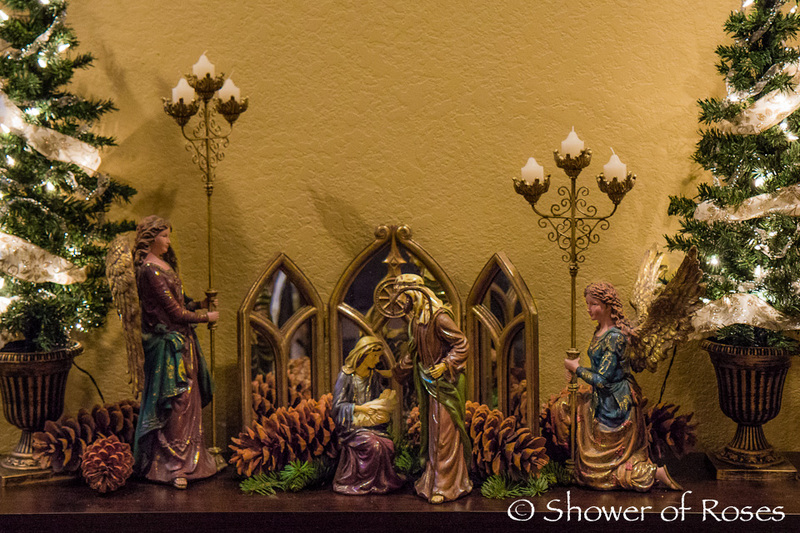 They match our Holy Family Statues too nicely to not display them together during Advent and Christmas! Were the angels part of the Holy Family set? Did the angels come with the set? 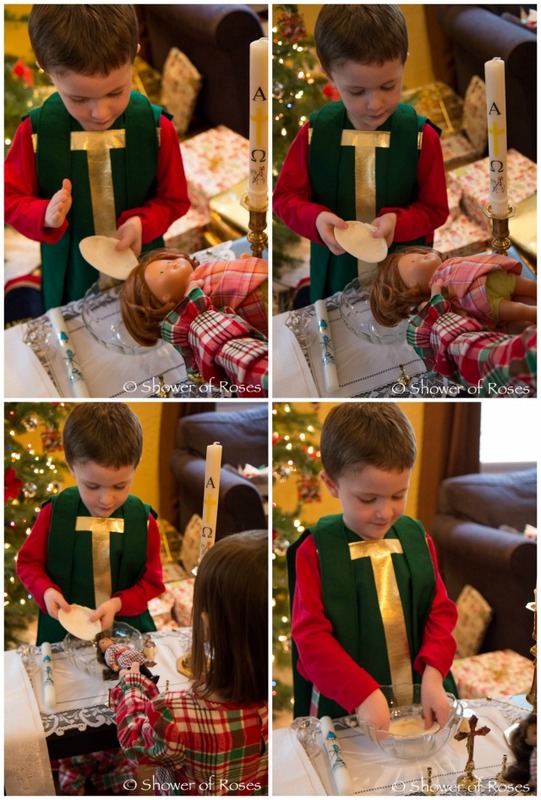 No, the angels did not come with the Holy Family set. They were also made by Kirkland and the two angels were sold together in one box. Thanks for sharing all this! You amaze me!! As for my gifts... My husband gave me two beautiful new scarves (one that is nearly identical to the one my mom and dad gave me on Christmas Eve! They know my tastes well! ), a Denim Skirt, a purse, the Saint Cecilia Cookie Mold (squeee!!!) and some perfume and chocolates in my stocking. In addition to the scarf my Mom and Dad also gave me a photo album with pictures of all my siblings from 2013 and a gorgeous bracelet. My MIL and FIL gave me a copy of Jane Austen's Seven Novels, the 2014 Tan Saints Calendar/Planner and Restless Heart DVD!